What can you say about a classic? 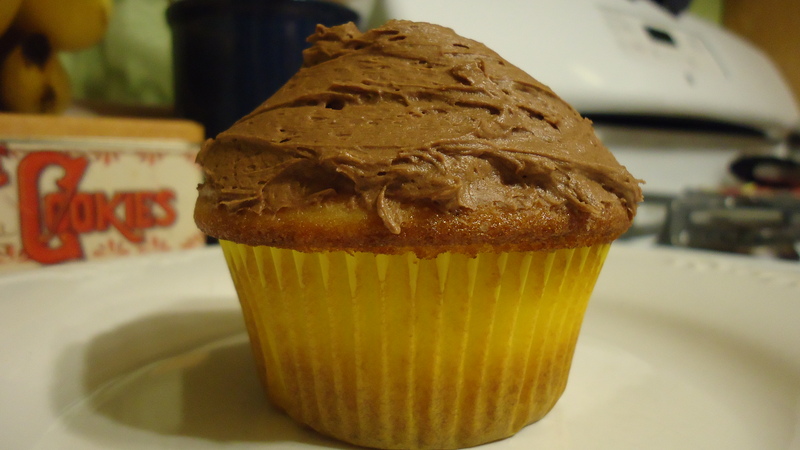 The yellow cake/chocolate frosting combination is the little black dress of baking, one that baker should have it in her repertoire. There seems to be something magical in the pairing of rich chocolate buttercream with mellow yellow cake, in the same way that a chocolate cupcake is finely matched with vanilla buttercream. They say opposites attract, right? In a mixing bowl, beat butter on medium speed for one minute. Add sugar and vanilla and beat until well combined. In a large bowl, sift together powdered sugar and cocoa powder; set aside. In a mixing bowl, cream butter for about one minute. Add powdered sugar and cocoa and beat on low speed to incorporate as much sugar into the butter as you can. I cover my mixing bowl with a kitchen towel during this step to prevent a sugar storm. Add three tablespoons milk and two teaspoons vanilla extract; beat for three minutes. Scrape down the sides of the mixing bowl and add the final teaspoon vanilla extract, then beat for another minute.